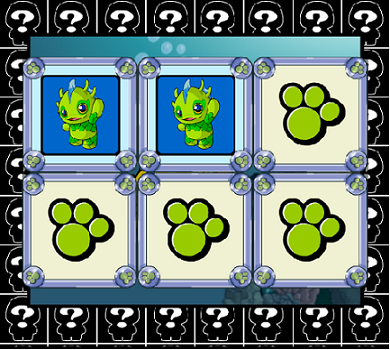 Petpet Pair-Up: The goal in this game is to clear the screen by matching up the pairs of tiles, much like Kiko Match 2. There are five levels to complete, and an increased number of pairs to match in each level. There are 2 pairs in level 1, 3 pairs in level two, 4 pairs in level 3, 6 pairs in level 4, and 8 pairs in level 5. I find that turning the animations off makes the game go quicker. Typing ineedmoretime will add an extra 15 seconds to the timer.